No matter what you are growing, hydroponic growing systems will let you grow it better. With hydroponics your crops will mature faster and yield heavier. Your plants will also be healthier with fewer disease problems. Forget about lugging around and mixing soil and say goodbye to the problems of disposing of soil too. 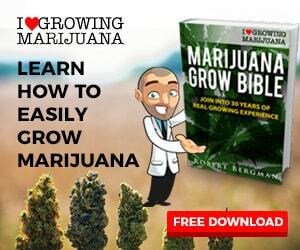 You will save money too, by using less nutrients and by not buying grow media. That also makes hydroponics the best way to grow weed indoors if stealth is an issue. With a hydroponic grow you will be able to feed your plants exactly what they need for maximum growth and yield and if for some reason a deficiency should arise, it is easily and quickly corrected. No more waiting for weeks to see a change like in soil. We have many different hydroponic grow systems to choose from. If you follow directions they will all perform well for you. Every situation and budget is different and there is no one perfect hydroponic system. If you are new to hydroponics you may want to try a simple bubble bucket along side a soil grow. Once you see the difference in growth rate and yield hydroponic growing makes you will become a true believer. Confused About Hydroponic Growing Systems ? If you are new to hydroponics things may seem confusing and a bit overwhelming. But actually hydroponics is really pretty simple to understand. Hydroponics comes from two Latin words and literally means “working water”, and this is a good description, in that we use water to do the work of soil. Hydroponic growing is simply the art and science of using water to provide plants with the nutrients they need rather than soil. Plants may have their roots in water or an inert medium like clay pebbles or perlite or even suspended in air. By removing soil from the growing equation we eliminate many soil born pests and diseases. We also eliminate problems with nutrient availability and deficiencies caused by soil. As a result plants are healthier and grow much faster than plants in soil. With open hydroponic systems, also called DTW (drain to waste) the nutrient solution is mixed and fed to the plants and any excess not used by the plants is disposed of. Closed or recirculating systems have a reservoir to hold and recycle the nutrient solution and feed it to the plants over and over again. Both systems have their advantages and disadvantages and which type you choose will depend on your medium, your crop and your level of management. Open systems are easier to manage because the nutrient solution is mixed fresh and there are no changes in its ph or ec. There is also less chance of spreading diseases from one plant to another. The disadvantage is these systems can be wasteful if they are not properly calibrated. Recirculating hydroponic systems reuse the nutrient solution and therefore generally use less nutrients than open systems. The downside is they require more careful monitoring. Because the plants will remove nutrients, the EC and pH of the solution can change. So daily monitoring and possible daily adjustments may be needed. It is easier for root diseases to spread from plant to plant also because they share a common recirculating source. These systems usually are required to be flushed on a weekly basis to prevent disease, algae and salt build up. Most growers seem to favor recirculating systems despite their higher monitoring requirements. The hydroponic drip system is one of the most widely used hydroponic systems. It is versatile and easy to set up. Hydro drip systems can be used with any media and work well with everything from coco to perlite. Hydroponic drip systems are a great choice for new growers or for those making the transition from soil to hydro. 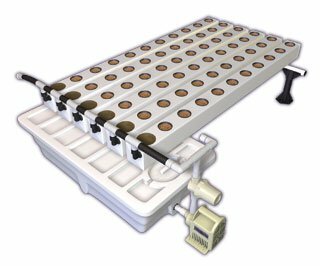 The basic system has a top tray that holds the growing containers. The top tray drains into the main reservoir, which is usually aerated, and then is recycled and sent back to the plants again. Some growers do use an open drain to waste system but most growers prefer a closed system. Usually a timer is used, but not always. A medium like coco with high water retention would probably be watered on 15 minute cycles every few hours, but a medium like hydroton or perlite may be watered continually. Hydroponic drip systems are fairly simple to maintain. The grower only has to maintain proper pH and EC levels and change the reservoir. Occasionally drippers may clog but they are easily cleaned and some growers just use open drip tubing without emitters and avoid the problem entirely. Drip hydro survives power outages fairly well, particularly if heavier media like coco or soiless mixes are used and in a pinch you can hand water your plants. The deep water culture system is one of the most popular and productive hydroponic systems. Originally the deep water culture system was designed to grow lettuce on Styrofoam rafts, it has grown and advanced into the hydroponic bucket system. No matter what kind of plants you are growing, they will do well with DWC hydroponics, yielding earlier and more than soil grown plants. The bubble bucket is simple to build and inexpensive to buy, one of the reasons it is so popular with growers. It is relatively easy to maintain and generally trouble free. You can use one grow bucket at a time or several. In simple bubble buckets the media, usually hydroton, is in a mesh pot fitted to the bucket lid. The water level is kept close to the top of the bucket while plants are young and then gradually lowered as the plant’s roots grow into the bucket. There are also deep water culture systems that have top feed drip systems incorporated into them which really helps get young seedlings off to a fast start. More advanced deep water culture hydroponics uses a series of buckets attached together and fed by a common reservoir. Using air stones is common in all DWC systems. The aeration keeps the roots growing and the nutrient solution moving. Taking it one step further is recirculating deep water culture, where the nutrient solution is actively recirculated using a pump. The air stones in these systems may be located in the reservoir, each individual bucket or both. Ebb and Flow hydroponics is another popular hydro grow system.. It is relatively easy and inexpensive to set up and gives good results. Ebb and flow hydroponic systems consist of a flood table and a reservoir. The flood table is simply an elevated waterproof tray which holds individual pots,rockwool cubes or slabs. Some growers simply fill the flood tray entirely with media and plant directly into that. But because the roots all grow together, cleaning up after a grow is difficult so this type of system isn’t used much. In the ebb and flow hydroponic system a pump in the reservoir floods the table periodically , which then drains back to the reservoir.The pump is controlled by a timer to run for 15 minutes every few hour. Usually the reservoir is aerated. Some ebb and flow systems are drain to waste but the majority are recirculating closed systems. Ebb and flow hydroponics is versatile. You can grow large or small plants in an ebb and flow hydroponic system and it will work with coco, soiless mixes, perlite or hydroton. Flood intervals will vary depending on the grow media used and its water retention properties. Coco or coco/perlite mixes work particularly well in ebb and flow hydroponic systems because they can hold moisture and allow for less frequent flooding. Another advantage of ebb and flow hydroponics is that in the event of a power failure the plants can be hand watered temporarily. 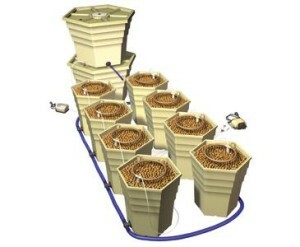 NFT or Nutrient Film technique is probably the most commonly used commercial hydroponic system, and many people have seen pictures of large commercial greenhouses that use NFT Hydroponics, but there are many smaller home NFT hydro systems also. One reason the NFT hydroponic system is so popular is its simplicity of design. It is basically a simple pump in a reservoir without a timer that pumps nutrient solution in a continuous stream down a slightly sloped PVC pipe channel.The end of the channel drains back into the reservoir and the process is repeated. Holes are drilled in the top of the NFT channel and small netpots containing seedlings or clones are inserted. The roots simply hang down in this channel and are continually bathed in nutrients. Plants are not grown in any type of media but rather are held in place inside the pot by a neoprene plug. This is a big advantage, it eliminates buying and disposing of grow media which saves both time and money. The downside to NFT hydroponics is it is very easy to lose a crop if there is a power outage or the pump fails. Aeroponics systems are similar in some ways to NFT systems and the two are sometimes combined. Plants are often grown in PVC channels using small inserted net pots and like the nutrient film technique, no growing media is used. The main difference is that an aeroponic system uses small misters to feed the roots nutrient solution. Aeroponics makes use of a specialized timer that can be set to run at intervals of one minute. A typical setting would be one minute on and 4 minutes off. Growth is incredibly fast in an aeroponic system because plant roots receive an ideal mixture of nutrients and oxygen. The downside of this system is that roots hang in the air and if the system goes down they will dry out quickly and die. Even clogged misters can result in plant death so these systems, while extremely productive, do require constant vigilance. Even though larger aeroponics systems can be challenging, smaller systems are ideal for cloning and the aeroponic cloner is very popular with many growers. 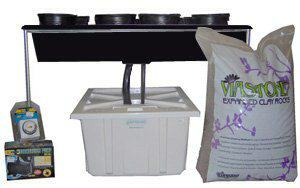 Passive hydroponic systems have no moving parts like the hempy bucket and wick system. The Hempy Bucket is a passive hydroponics system, meaning that there are no moving parts. This is probably the simplest hydroponics system there is. It still offers the advantages of hydro over soil growing and yields can be quite good. Best of all hempy buckets are easy and cheap to make yourself. 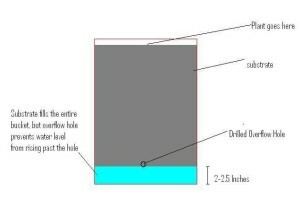 All you need is a 5 gallon bucket (you can use other sizes too) with a hole drilled on its side, 2 inches from the bottom. Place or glue a small piece of fiberglass screen over the hole on the inside of the bucket to keep all the grow media inside. Then fill the bucket with perlite, a perlite/vermiculite mix or a perlite/coco mix. Water it with a nutrient solution until water runs out the hole and set your plant in it. You may want to put your hempy in a tray to catch the run off. Hempy buckets work because they have a built in reservoir of nutrient rich water in the bottom of the bucket. Growth can be explosive once the roots reach the reservoir. The only disadvantage to the hempy system is that you will need to hand water your bucket every 2 or 3 days. Wick system hydroponics is a passive hydroponics system, meaning it has no moving parts. 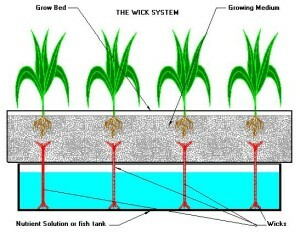 The wick system works by drawing a nutrient/water solution from a reservoir to the plants by means of an absorbent wick. Wick hydroponics can use virtually any growing media such as coco, perlite, vermiculite or a mixture of these. The main disadvantage of the wick system is that larger plants may need more water than the wicks can supply.